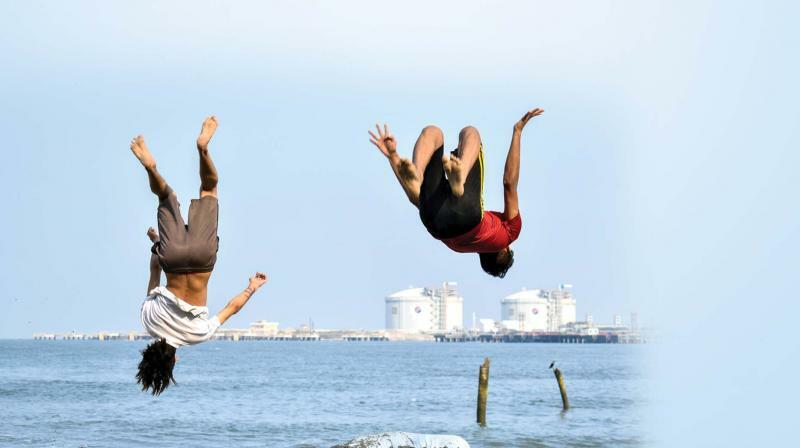 The three-hour parkour training session amused the onlookers and joggers at Fort Kochi Beach recently. The air was ecstatic at Fort Kochi Beach. It was like a scene straight out an action adventure movie — youngsters vaulting, jumping, running, hanging from ledges and precisely landing on their feet. Those who were on their morning stroll at the beach watch in awe as the moves resembled a dance form or a gymnastic show. Fort Kochi, on Sunday morning, had its first-ever parkour experience; thanks to Kozhikode-based Brink Impulse which held a training session for persons above the age of seven. Parkour, the sport, shot to fame in Kerala last year after the release of the film Aadhi, where Pranav Mohanlal’s free-running act offered the audience an adrenaline rush. But parkour has been here for a long time. “We have been in the business for the past 14 years,” says Shravan, who usually holds his sessions in Kozhikode Beach and premises. A computer science graduate, Shravan chose parkour as a career after he realized that it has grown in him beyond a passion. “I have been parkouring since class 10. It’s a limitless exercise and a full body workout for both body and mind, while keeping us energetic and active. We also get quick reflexes which would be beneficial in daily life,” says Shravan, who considers parkour a talent activity that boosts both physical and mental health. Parkour, for him, is a different type of experience. “It’s a fun exercise compared to activities in gym and yoga centre. And everyone can do it,” says Shravan, who had worked behind the stunt scenes in Aadhi. It’s to spread the passion that he found Brink Impulse, to train children in free-running and other skills. Another participant, Aevion, too vouches for it. “Engaging in activities like parkour makes me confident. High-impact sports like this also helps improve fitness, especially in developing bone strength,” says Aevion. Now that their first session has become a hit, Brink Impulse will be around for some more time — to offer the city more euphoric mornings.